The IRS Form 8949 report generates an IRS ready report for directly filing with your Schedule D. Form 8949 is used for tax years 2011 onward. Please note that all tax year reporting will show a DRAFT watermark until you have completed the End Tax Year process on the TradeLog file. Final tax reporting should always be generated once the End Tax Year process has been completed. If you wish to run this report for tax filing information, you should make sure you click the All Trades button, which removes any data filtering, before you run this report so all of your trades for the current tax year will be included. Please note that the Form 8949 report will ONLY include realized gains and losses for the current tax year, unless you change the Start and End dates. 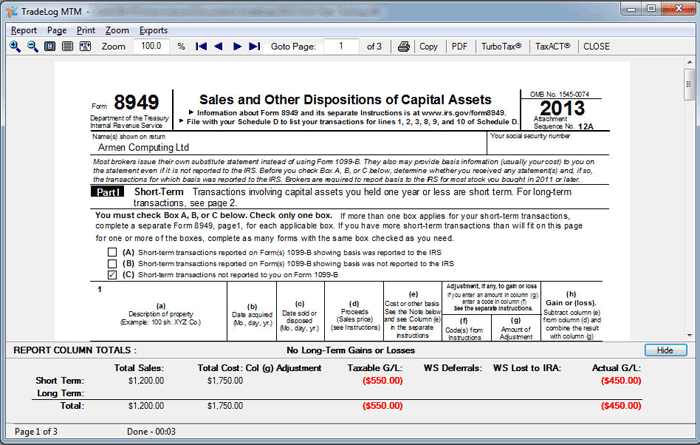 For final tax reporting the report should be run by selecting the All Accounts Tab in a multi-account data file. G&L Start and End dates - These are set by default to only include gains and losses realized from January 1 through December 31 of the current tax year. If you wish to run this report for a smaller date range such as one month or one quarter of the year, you may change the Start and End dates appropriately. 1. If you would like your Social Security Number or EIN to be shown on your reports, please check the box beside Show SSN/EIN On Report. Click here for details on where to enter your SSN or EIN. 2. If you need a PDF version of your Form 8949 for direct e-filing with the IRS, check the box Create Form8949.pdf attachment for e-filing. When you run the report TradeLog will generate this PDF - which does not include the Schedule D summary page normally generated for your convenience. Click here for more details about this feature. 3. 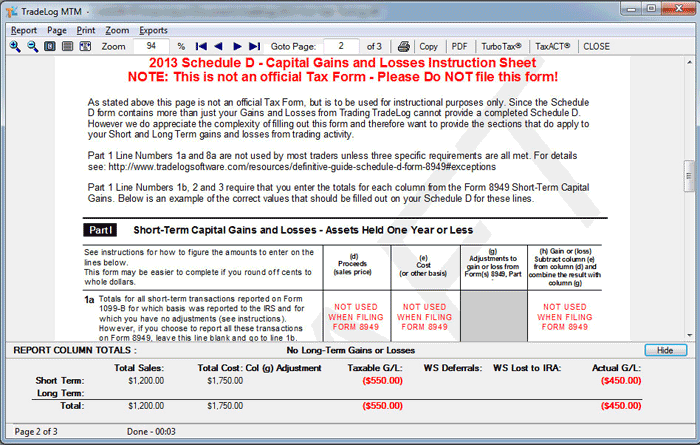 For 2011 - 2013 tax years there are two options for dealing with 1099-B reconciliation, differences, and adjustments. For 2014 tax year onward the only option is to Include Statement Explaining Differences and Adjustments Between Form 8949 and 1099-B. To learn more about this option click here. Note: the check box There Are Other Errors On My 1099-B is available when the Statement Explaining Differences option is selected. Click here to learn more about this check box. 4. Click Run Rpt to generate the 8949 report. The IRS Form 8949 report will display. Sample shown below. The last two pages of the report will show an Instruction Page with totals carried over from Form 8949. This will assist you in entering proper totals on your Schedule D. The last page generated is the Statement Explaining Differences and Adjustments Between Form 8949 and 1099-B (if that option was selected), or else a page with additional information about TradeLog Form 8949.